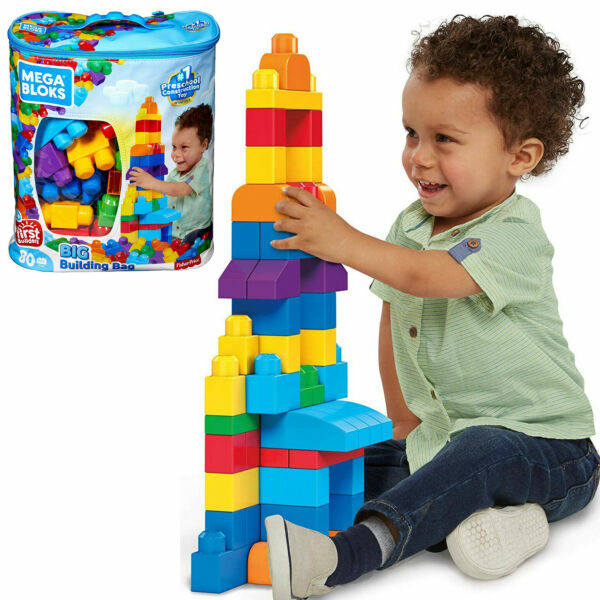 150 PIECES: Your building block set comes with 150 different sized and colored pieces that come in bright and vibrant colors. Included in the set are five rolling vehicle bases with wheels that can hook together like train cars! TONS OF OPTIONS: Little hands will love the block size and fun colors! Complete with a storage and carry bag for easy transportation, this is the ultimate set for little builders to create buildings, cars, houses, animals, and anything else they can imagine! IMAGINATIVE PLAY: Let your child's imagination soar with this 150 piece block set! Playing with blocks of different shape and size allow children ages 1 and up to explore their creativity in many ways. With building block, imagination is the limit! Create buildings, houses, cars, trains, animals, and more! Little hands will love the block size of the Dimple 150 Piece Building Block Set, complete with storage/carry bag for easy transportation. This is the ultimate set for little builders to create buildings, cars, houses, animals, and anything else they can imagine! Featuring 150 durable plastic blocks in bright and vibrant colors, including five rolling vehicle bases with wheels that can hook together like train cars, your little creator’s imagination and creativity will soar as they spend countless hours creating masterpieces that they will be so excited to share with you! Get in on the fun and spend some fun quality time with your children as you create everything under the sun with this extraordinary building set! Our standard shipping service is free, your order will be processed within 3 business days after your payment. Shipping time varies from 1-3 business days. We only ship to the lower 48 states and do not combine shipping or offer local pickup. We do NOT ship to PO boxes or APO`s.